FIGHTING to keep Project Merlot on the racing line was the primary challenge for Eastern Region members during their second track day. Patches of ice and standing water still covered the famous Snetterton circuit at 8.30am, so track action was delayed by an hour until the surface was deemed safe. A crowd of ER supporters lined the pit wall, as the Merlot plus three other club MX-5s made the most of the opportunity to drive unlimited laps - with plenty of thrills and just one spill. Jon Elsey’s 360-degree spin carved deep into the grass at the first corner. He said: “It was on my second lap in very damp conditions and I watched in my mirror – and through the windscreen! – as the Fiesta behind spun in sympathy at the same time. Jon’s only regret was that his video camera had stopped running, and missed capturing the moment. Eastern Region coordinator Martin Curtis, and Robbie Marsh were also to take their turn at the wheel of Project Merlot. 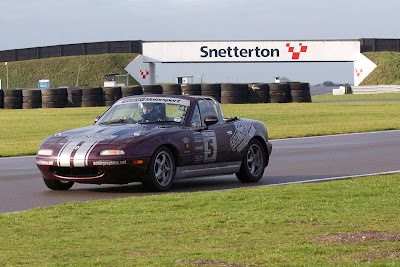 Motorsport nut Ken Ward dared to drive his own MX-5, as did Norfolk’s Kevin Allen with his new racing wheels and tyres on his local track. Everyone listened to a safety briefing, along with the drivers of the 34 other cars which covered a huge range from a professionally-built racing Renault Clio to an ex-police Vauxhall Omega, with a handful of Lotus Elises thrown in for good measure. As the track day was a novice event, a few words of tuition were given before drivers were allowed to get behind the wheel. Cones and signs were placed around the track, showing where to brake and turn for each corner. These aids helped the drivers gradually gain in confidence, as they negotiated Snetterton’s two chicanes, sweeping corners and long fast straights. Martin’s driving went well despite the fact he was having a bad day – Mrs Sharon Curtis could have driven as Martin brought her license by mistake, and officials wouldn’t believe his cross dressing fetish! After a quick call to the DVLA to confirm his identity, he was allowed on to the track. He later missed not one, not two but three waved red flags ordering a return to the pit lane because of an incident. The evidence is on tape Martin! This followed him getting a black flag at Donington Park last year on Merlot’s first outing. Many other ER members enjoyed the thrill of the day and took the chance to participate. Passengers Ady Neill, Steve Alleyne, Jamie Tink, Ian Ward, Kendra Dixon and Tracey Sparling put their lives in the drivers’ hands, and climbed in to the game little car to see what it was capable of. Any members who wanted to experience Project Merlot on our region’s local track, could obtain a passenger wristband and jump in. Katie Pyle was a passenger in speed demon Ken’s car, and Kendra even talked officials in to giving her a fast ride in the safety car. The three Merlot drivers clocked up 190 miles in total. There was no stopping them - until Robbie’s fear for the petrol tank running dry, got the better of him. He had to drive the car home, via a refuelling stop, after all! Just to add to Martin’s trying day, when the time to leave came, he discovered his car battery was flat. Even this setback failed to dampen members’ spirits as everyone gave him a push start. Thanks to Tracey and Jon for the words and photos.